Workforce Analytics / Planning is a module not a lot of customers considered implementing in the early Cloud days. Now, after several years of Talent Management (or even Core HR) in the Cloud and a better feeling of the SuccessFactors suite, it starts to get interesting. In this article, Jamie from 3D Results names the most important things to consider during a Workforce Analytics implementation and I follow up with some more recent information and Release Updates around WFA. 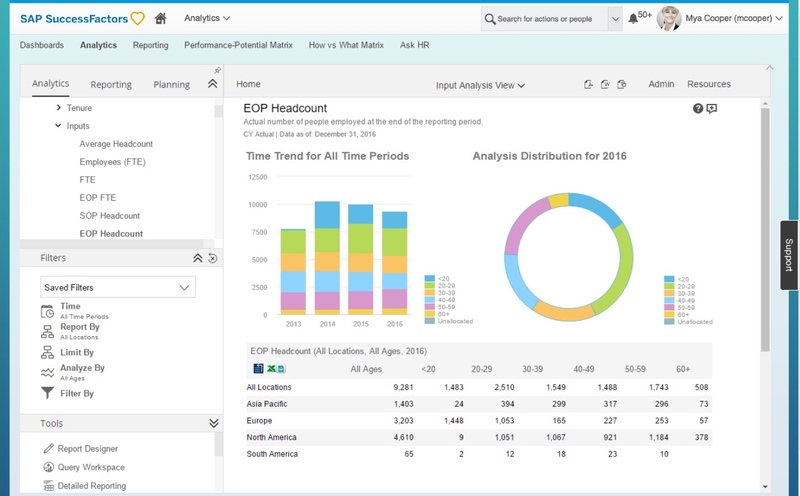 Workforce Analytics (WFA) is one of SAP SuccessFactors modules in its suite. This module leverages an organization’s data to unlock people analytics potential and insight. The tools provided in this module provide more capability and functionality than SAP SucccessFactors native reporting and analytic tools (as described in my previous series of reporting articles). It helps organizations create effective strategic reports and provides people analytics tools to provide insight and drive effective decision making. Workforce Analytics is a strategic reporting and analytics tool that requires an organization to engage a Professional Services team to implement. 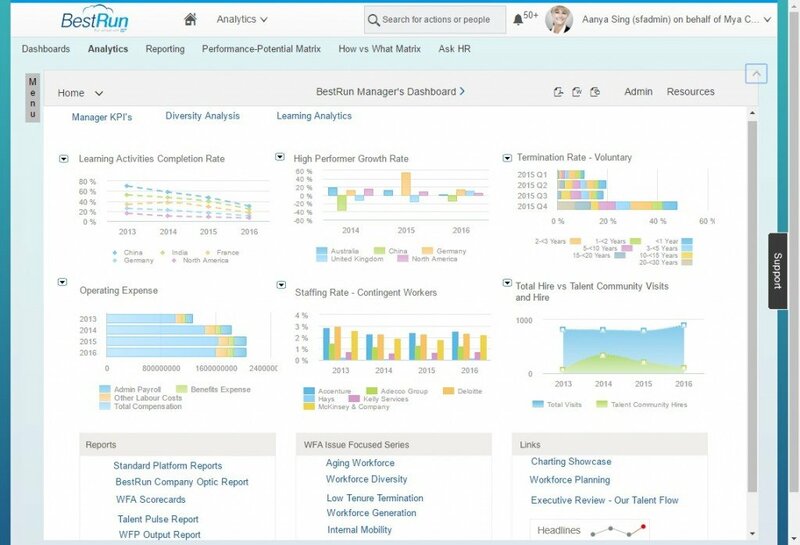 This is different from SAP SuccessFactors cross-module native reporting tools (Ad-Hoc Report Builder, Dashboards, Online Report Designer with Ad-Hoc or Advanced Reporting). The implementation with the Professional Services team focuses on defining the data sources for the key dimensions and measures that will be implemented as part of the solution. Because the foundation of Workforce Analytics is people (employees), traditionally the implementation starts with HRIS data. Workforce Analytics is system agnostic so data from any HRIS (e.g. Employee Central, SAP On Premise, Lawson, Workday, custom company-specific system, etc) can be implemented as the base, as well as for subsequent Metrics Packs (see section below on Metrics Packs for more information). The implementation of the Workforce Analytics Core Workforce and Mobility Metrics Pack traditionally takes 120 to 160 days. The focus of the implementation is on the key data source(s), acquisition of data (technical integration if needed), validation of data, strategy, change management, report creation and roll-out strategy to end users. During the initial implementation, the customer will decide how many years of data they will want to see for historical trending. SAP SuccessFactors will pull full data from the database to create those historical trends, which is another reason it is important to start the data model / foundation with an effective dated, transactional HRIS system. Traditionally, the recommendation is to start with 4 years of data because it will provide internal benchmarking and context to the data. This may not always be a feasible option because the customer does not have clean data before a specific date or there may have been a major acquisition that means that the organization today is very different than the organization historically. In those situations, the implementation consultant may recommend only 1 to 2 years of data for initial implementation. There are other organizations who have clean data and are very stable across time that it may make sense to bring 10 years of history into Workforce Analytics. This will be a key decision point and discussion during implementation. Also if a customer has recently switched HRIS systems, it is possible to source data from a historical file along with their current system. This discussion should be part of the scoping/ requirements and pros/ cons should be considered. A good implementation consultant will ensure that the discussion focuses as much on the reports, end user access to the data, as to the technology and data construction. 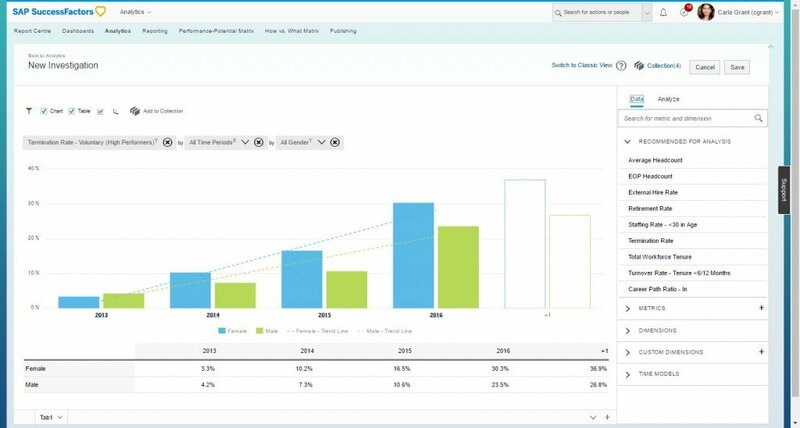 Following the initial implementation of the Core Workforce and Mobility Metrics Pack, other SAP SuccessFactors Metrics Packs (i.e. data from other SAP SuccessFactors modules or external data sources) can be implemented. Implementation of those data sources will traditionally be completed sequentially and take between 30 to 120 days to roll-out to end users dependent on the complexity of requirements and availability of the customer’s team. Security is not the same as the SAP SuccessFactors’ native reporting and analytics tools. Because Workforce Analytics is aggregate data, row level data access is controlled through hierarchical structures. The structures are defined as part of the initial implementation, so it is important for customers to understand the implications of making structural decisions in conjunction with security. These hierarchical structures allow users to see down, across and details for part of the organization. 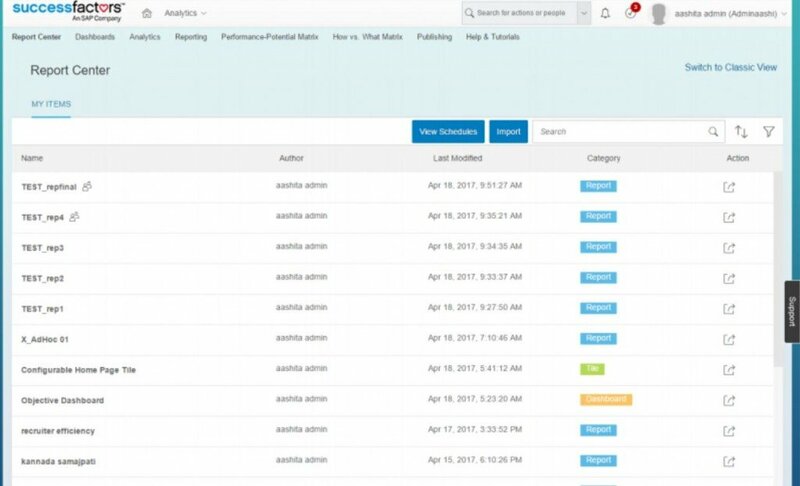 Access to names and details about individual measures can be turned on/ off for specific users, but there is no cell level permission (as there is now in other SAP SuccessFactors reporting tools). SAP SuccessFactors’ has recently integrated security controls for Workforce Analytics into its centralized security structure, so all new customers will be able to set security in one location, but they still must be aware of the nuisances of securing aggregate data. There are many other key considerations to take into account during an implementation. Because SAP SuccessFactors has over 30 years of experience in implementing Workforce Analytics and working with customers across the globe, they have a very robust data model and foundation for implementing Workforce Analytics that cannot be paralleled to a custom built model. But even with that foundation, every customer is nuanced in how they’ve implemented their systems and think about their people and their structures, so there will be important discussions during the implementation on many issues including, but not limited to global employees, languages, process, currency, conversion, structures. In the first two Releases in 2017, there happened a lot around Workforce Analytics; not just the announcement of “big” features, but delivery of them. Some of the recent things I want to summarize. 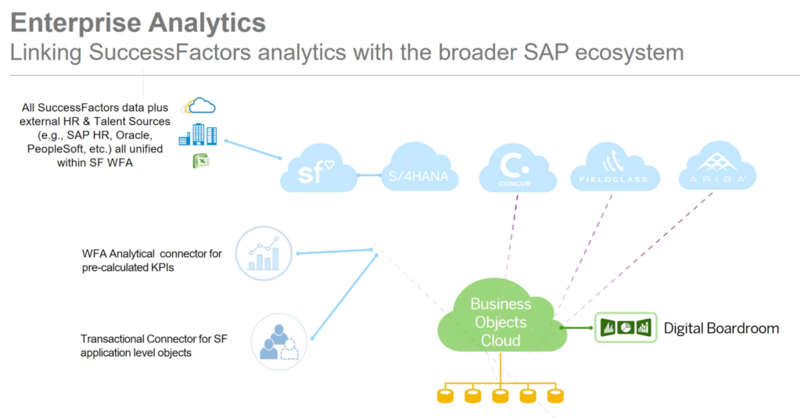 In Q1 2017 SuccessFactors introduced SAP Business Objects Cloud (BOC), a connector supporting the Workforce Analytics API. This connector allows users to import data from WFA for analysis and inclusion within BOC models and stories. It is the first time WFA data has been made available externally to the SuccessFactors HCM application. Big news for Partner as SuccessFactors plans a new Certification for Q3 2017, which allows SAP Partners to implement WFA for customers. This was not possible before! The second Feature is the Reporting Center, which was released first in Q3 2016 and still runs as a Beta. In Q1 2017 every Customer could activate it and in Q2 2017 they added Report Center Scheduling. So no more SAP Support or Partner help needed for Scheduling Ad-Hoc Reports. Even if there are just two major Release Updates with new features in 2017, checking Release Updates is important; as important as it is to know what is coming. Check out the latest Road Map from SuccessFactors (April 2017 – Source: Customer Community) or sign up for the next Road Map Webinar in second half of June (Source: Customer Community. I hope this gave you a good understanding of the SAP SuccessFactors Workforce Analytics implementation. Special thanks to my co-author, Jamie Strnisha, Senior Principal Consultant at 3D Results. She has been working with SAP SuccessFactors Workforce Analytics and Planning customers since 2008. I am very happy she contributed to this article with her experience from many WFAP customer implementation to enhance your understanding of Workforce Analytics. You still don’t have enough and want to learn more? We offer various SuccessFactor Reporting Trainings. If you have bespoke training needs, the packages can be adjusted accordingly. Just ask – we are happy to help. Same counts for a SuccessFactors Demo. Accordingly to your requirements we prepare a SF Demo to show how things work and what options you have. Useful, meaningful information on the latest developments in WFA and what’s coming up… Thanks!